I’ve had decent luck with houseplants and even planted my share of trees and shrubs in the yard of the first house I bought, but it was only recently that I actually grew something edible and even that was by pure chance. 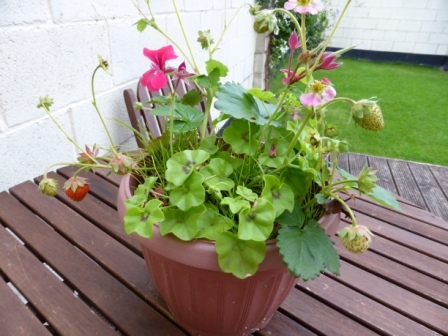 My friend Juli who was visiting this summer discovered a few strawberry plants in a planter left behind by my landlord. I had written off the pot as stray weeds. She cleaned the abandoned pot and placed the forlorn looking plants inside with several rescued flowers. It was nearly July so the chance of the strawberry plants actually bearing fruit was pretty slim. 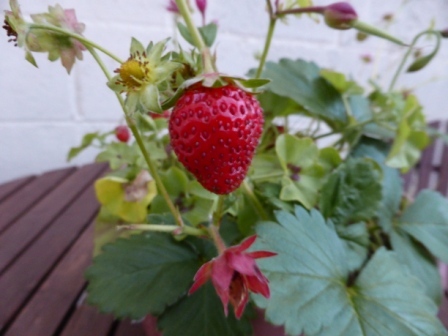 However, the unseasonably warm summer worked its magic and in late August I had my first berry. There’s still hope for a few more, weather permitting! Was it the freshness – just off the vine, that made it taste so sweet? Or the fact that I had grown it myself (granted, I didn’t buy the plant or put it in a pot, but I did manage to remember to water it during the lengthy heat spell). The days grow shorter at a pace now, and I may not get more than a handful of small berries from this plant, some no bigger than a raspberry, but I will enjoy each one, however small, more thoroughly than if I had purchased them in a store. I was amazed at the difference! Too bad the season was short for me this year. I’ll have to start earlier next year.